In December 2013 the OECD’s Working Group on Bribery reported that Ireland had broadened the forms of bribes covered by the foreign bribery offence in the Prevention of Corruption (Amendment) Act 2010. Ireland now has jurisdiction over foreign bribery committed abroad by Irish companies and nationals. Sanctions for false accounting offences have increased. But the OECD’s Phase 3 Report on Implementing the OECD Anti-Bribery Convention in Ireland is silent on the public finance system that fuelled bribery in Ireland over the past 20 years. A series of public investigations have revealed a catalogue of abuses by land developers, public officials and politicians who bribed their way to small fortunes in the process of extracting rents out of the public domain during the property boom. The financial incentives for corrupting morality remain in place today, awaiting the temptations that will re-emerge in the next real estate bubble. And, ironically, enhancing the system of justice itself is not sufficient to diminish the risks of corruption. Tax-funded investment that improves civil justice would boost productivity, innovation and people’s living standards, according to another report from the Paris-based think-tank (OECD 2013). Again, missing from the analysis is any appreciation of the role of fiscal policy in the process of corruption. Protection of property rights and enforcement of contracts encourages savings and investment and enhances competition, innovation, the development of financial markets and growth, notes the OECD. Reducing litigation rates increases the efficiency of civil justice. 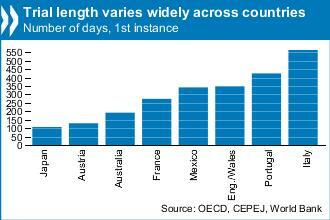 The scope for improvements to performance in OECD countries is enormous (see chart). But bringing the least efficient countries up to best practise would come at a price. The net gains from improved systems of justice would translate into higher location rents, thereby encouraging rent-seekers to reap some of that value by political manipulation and illegal means. Property owners, particularly those who were speculating in land subdivisions and were unable to dispose of their holdings, complained that they were unable to receive the benefits they expected, and were successful in having the [tax] rate reduced in 1933 and again in 1936. In 1938 it was discontinued altogether (East 1944). The bridge cost £9.8m to build. Taxpayers recovered £2.4m. Since then, the continuous increase in productivity has gone into the pockets of land owners.